The earliest dispersal of humans into North America is a contentious subject, and proposed early sites are required to meet the following criteria for acceptance: (1) archaeological evidence is found in a clearly defined and undisturbed geologic context; (2) age is determined by reliable radiometric dating; (3) multiple lines of evidence from interdisciplinary studies provide consistent results; and (4) unquestionable artefacts are found in primary context1, 2. 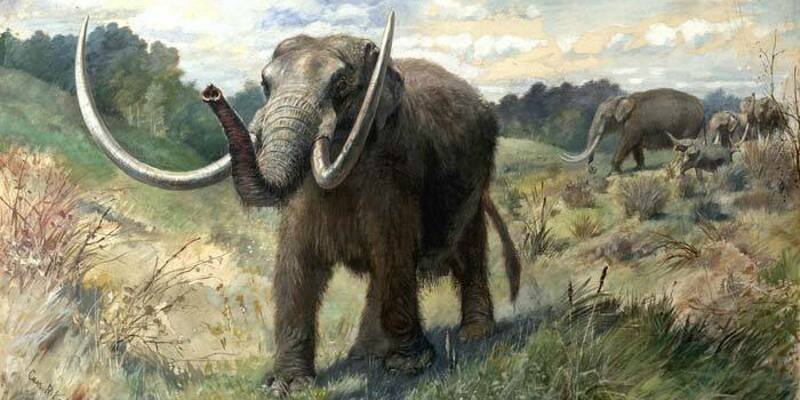 Here a team of scientists describe the Cerutti Mastodon (CM) site, an archaeological site from the early late Pleistocene epoch, where in situ hammerstones and stone anvils occur in spatio-temporal association with fragmentary remains of a single mastodon (Mammut americanum). The CM site contains spiral-fractured bone and molar fragments, indicating that breakage occured while fresh. Several of these fragments also preserve evidence of percussion. The occurrence and distribution of bone, molar and stone refits suggest that breakage occurred at the site of burial. Five large cobbles (hammerstones and anvils) in the CM bone bed display use-wear and impact marks, and are hydraulically anomalous relative to the low-energy context of the enclosing sandy silt stratum. 230Th/U radiometric analysis of multiple bone specimens using diffusion-adsorption-decay dating models indicates a burial date of 130.7 ± 9.4 thousand years ago. These findings confirm the presence of an unidentified species of Homo at the CM site during the last interglacial period (MIS 5e; early late Pleistocene), indicating that humans with manual dexterity and the experiential knowledge to use hammerstones and anvils processed mastodon limb bones for marrow extraction and/or raw material for tool production. Systematic proboscidean bone reduction, evident at the CM site, fits within a broader pattern of Palaeolithic bone percussion technology in Africa, Eurasia and North America. The CM site is, to the knowledge of the scientists, the oldest in situ, well-documented archaeological site in North America and, as such, substantially revises the timing of arrival of Homo into the Americas. Considerable criticism has been levelled against the interpretation of the spiral fractures and the micro-wear evidence being hominin-induced. Despite this, the radiometric dating methodologies have been well received. Dr. Andrew Millard discusses the radiometric dating further.